This is for all those who have tried to work with the Müller & Sohn draft for men's lounge coats. This is relatively advanced stuff and not aimed at the beginner, therefore I will assume that you have an understanding of the techniques shown in the images. Nonetheless, I am aware that beginners will read this anyway, so I'll start with a very vital step. First step: Checking (trueing) the pattern for matching seam lengths, the smooth shape of neckhole and scye and the congruency of the seams at front ant back. Same with the sleeve pattern. Place the pieces with the actual seam lines on top of each other. Make sure that there are no edges or holes where the pieces meet. The centre front of the Rundschau sleeve is relocated inwards, usually by about 2cm. This causes the upper sleeve to have a slightly shorter front seam, which is corrected by shaping/ stretching it with the iron. Abb. 47: The front piece has been prepared, which means it's marked in, the front dart is closed and the wedge at the waist is taken out. You can already see the slight fullness in the chest created by this. Abb. 48: Stretching of the side seam at the waist level. This is mainly done to allow the inlay to fold without distortions once the seam has been pressed open. Abb. 49: The iron is driven towards the centre of the chest, while the other hand grabs the fullness. Abb. 50: The front is stretched along the upper chest, this results in a bit of excess length in the front scye. Abb. 51: The length is partly shrunk (lower scye), partly stretched out (upper scye). Abb. 52: Let the iron rest for a while to preserve the shape. Abb. 53: At the CF you strat with the iron at waist level. Abb. 54: The chest is then thoroughly stretched, the iron follows the free hand towards the shoulder seam. Abb.55: The front is shrunk, this shortens the bridle as well as the lapel. Abb. 56: Shows the finished front with sufficient fullness in the chest. Next follows the treatment of the (modern) shoulder. The images show the treatment for a 50's shoulder, which was not curved and had relatively little padding. Abb. 57 to 61: The inlay at the front neck hole is slightly stretched, the excess length can be transferred to the armhole (to create room for the shoulder bone). The stripe/ grainline has to be kept straight. Abb. 62: Shows the finished front part. Abb. 63: The stripes should run straight (perpendicular to the waist line) up to the neck, something that can be achieved with this sort of ironwork. Abb. 64 and 65: Straighten and stretch the side panel like shown, this is necessary because of the defined taper in the waist. Abb. 66: The inlay at the side seam gets a good stretching to avoid later distortions. Abb. 67: The finished side panel, showing no distortions. The actual Rundschau pattern is in the centre back a bit different to older systems. The difference lies below the waist. In older (and Italian) drafts the CB runs down straight as a perpendicular to the waist line, whereas the Rundschau back is slightly angled. 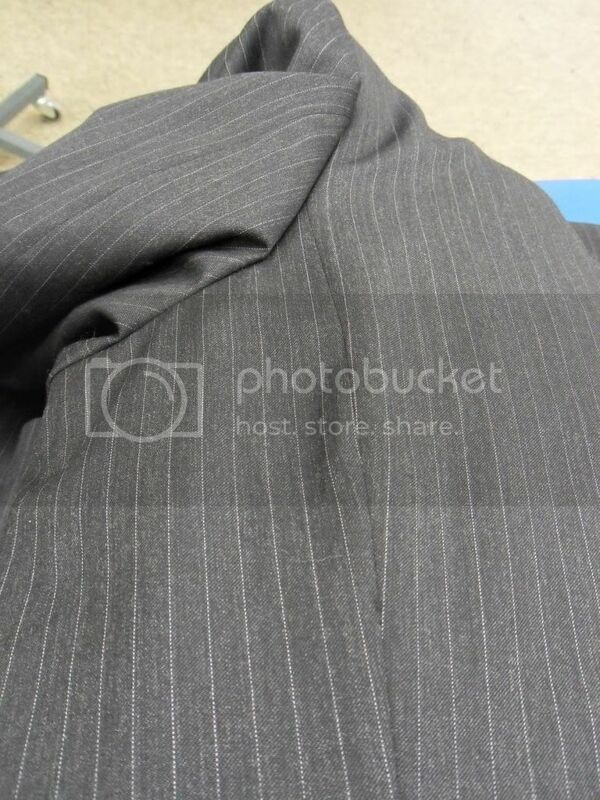 The back piece is laid out on the cloth in the same way like all the others, with the CB below the waist following the grainline of the fabric. Because of the slightly angled back construction, the back neckpoint is further away from the CB, which is corrected by the shaping with the iron. Before the early 50's the pieces of a coat were treated differently, especially the scye in the back was usually more shrunk than stretched. 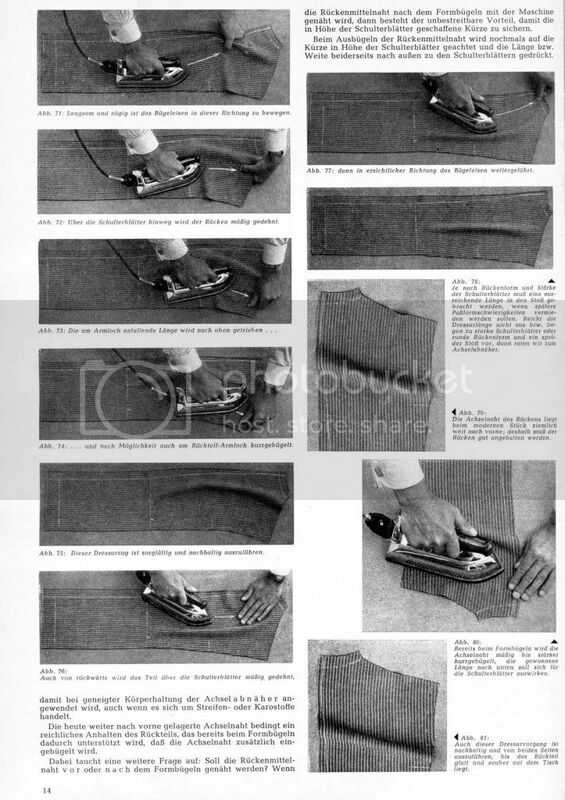 Then, at the start of the 50's, Müller & Sohn published another way of treating the back, which is shown in the following images. The thought behind it is the fact, that any cloth does not allow much shrinking or stretching along the straight run, either warp or weft. But, when using the bias of the fabric, it can take much more ironwork. Abb. 68: Stretching of the inlay at CB. Abb. 69: The iron is pushed til half of back part. Abb. 70: Starting at the side seam, the back part is stretched towards the neck. Abb. 71: You start by holding the back piece at the CB, moving the iron slowly but steadily from the side seam towards the upper neck. Abb. 72: You stretch the back along the blades. This creates a certain length in the cloth along the scye. Abb. 73: This excess length is driven towards the shoulder. 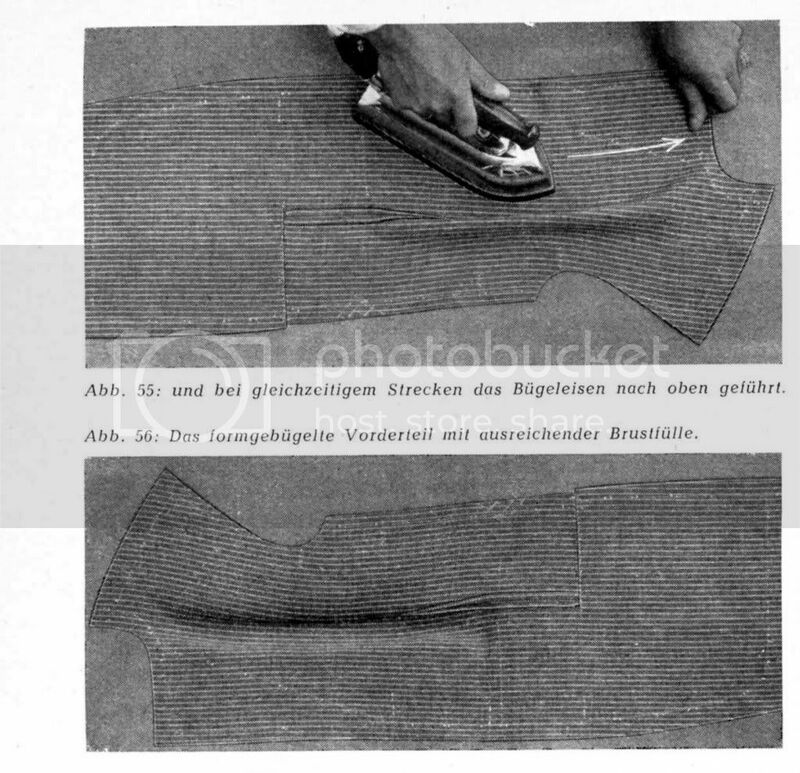 Abb.74: The rear scye is pressed short in the process.Depending on the fabric, this might have to be done repeatedly. Abb. 75: Shows the back so far. Abb. 76 and 77: Shrinking the CB. The roundness in the upper CB is straightened and the length is pressed towards the blades. A way to shorten the CB in this section before pressing is to gather it along the marked seam (preferably on the inlay side) with a double basting thread. Abb. 78: The result so far. Abb. 79: The shoulder seam of the modern coat is placed forward and therefore needs some ease (note the „wave“ of cloth at the shoulder seam). For a person with a round back or strong blades they recommend a shoulder dart. Abb. 80: This length in the shoulder is shrunk, starting above the blades (to keep the length there). Abb. 81: This shrinking process has to be done until the shoulders of both back parts lie flat on the table. 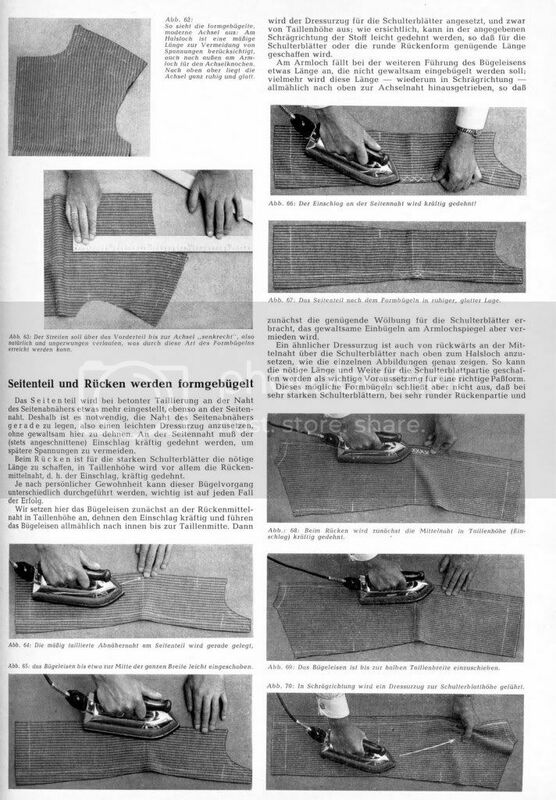 Abb.82: It is advised to sew the CB dierctly after it was shrunk, this way the shortness will stay in place. The CB seam is pressed open from the neck down, the length is distributed towards the blades. Abb. 83: The finished back. by the way, abb. 55,56 seem to be missing. Thanks for the hint, I fixed that. There is more stuff in the booklet these pages are from, but most of it has been covered elsewhere. I'll have a look to see if there's something in it that is worth a translation. There is an entry on Jefferyd's blog about the shaping of the front edge of an upper sleeve, but I just couldn't find it. What I would like to know is the best way to sew the chest dart/ pocket line on the wedge. In my work it's simply not done but I have been curious on how it is worked up. Absolute wonderful work, Schneidergott. And perfect timing considering I'm going to attempt to make one of these very coats for the very first time. Thank you so much. You fold the front part along the dart and stretch the seam allowances of the dart. At the top you place a piece of self-cloth or thin felt, cut on the bias. Then make little snips like shown in the diagram, pressing the dart open where the seam allowances are wide enough. At the top you fold the dart tip to one side and the cloth to the other. This way you get a flat dart. 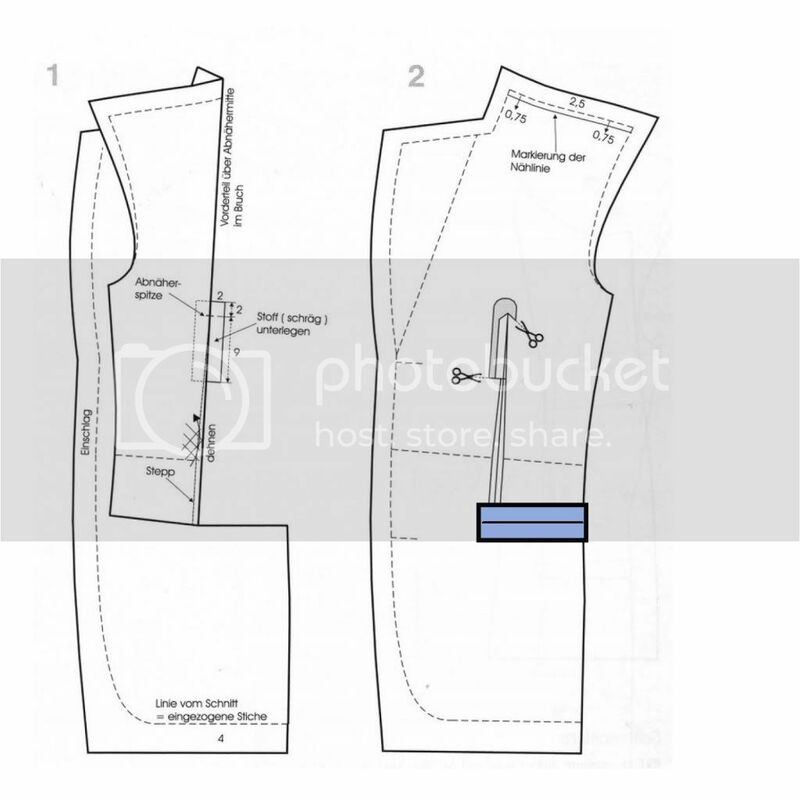 The wedge (which will cause the pattern not to match at the front seam) is closed by sewing a piece of lining or thin pocketing under the edges of the opening (blue area). If you want the cloth's pattern to match all around the coat (including the sleeve) you must not use the wedge. Keep in mind that for the first fitting you must not cut in the front at the pocket. Since your friend is very slender it might be a good idea to have a fish dart, which ends above the pocket (no wedge), so you just baste it. If you think you need a wedge you can have the original dart and pocket/ wedge when you have decided about the final position of the pockets. SG is revealing all the tricks, excellent, excellent. Keep in mind this is the German scientific way which is the only way, there is no other right way then this way. Any other way is ancient and only for historic garment. Very important the modern axle, I think they appeared in 1950. 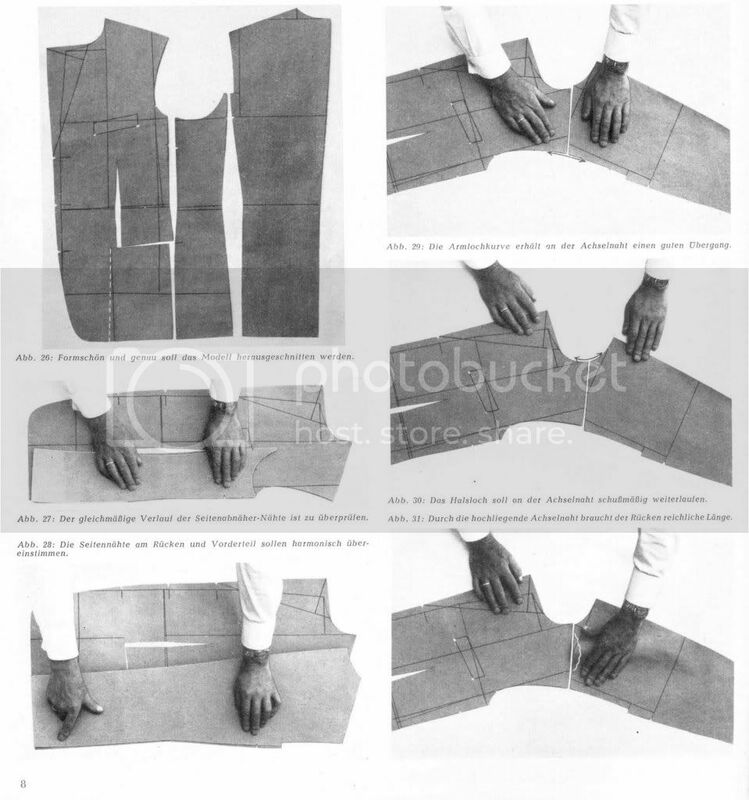 If you want to make a suit from 1936 they use the old form axle. The suits were tight fitting like tanks with good shoulder pads, in the 70thies similar, today suits have width it would look strange with the old axle form and natural shoulder line. And also keep in mind they do that with the 16lb iron on the felt mat not with 3lb 500$ steamer on the homebody board. Edited by Der Zuschneider, 07 September 2010 - 12:09 PM. this is the German scientific way which is the only way, there is no other right way then this way. DZ you sound like an Al-Qaeda tailor! I picture you on the back of a arabian horse waving shears over your head yelling "Schnittahu Akbar"
Edited by J. Maclochlainn, 07 September 2010 - 02:49 PM. The only way? I would not go that far, I'd say one of many, although Rundschau is a very easy system to use. If you know how to ship around the "cliffs" other systems have, they will bring good results, too. Bear in mind that Great Britain and Italy are still strong at bespoke tailoring with a worldwide reputation, while the Rundschau system (or at least a mutation of the original) is mostly found in RTW. And the felt mat? That is so old school. 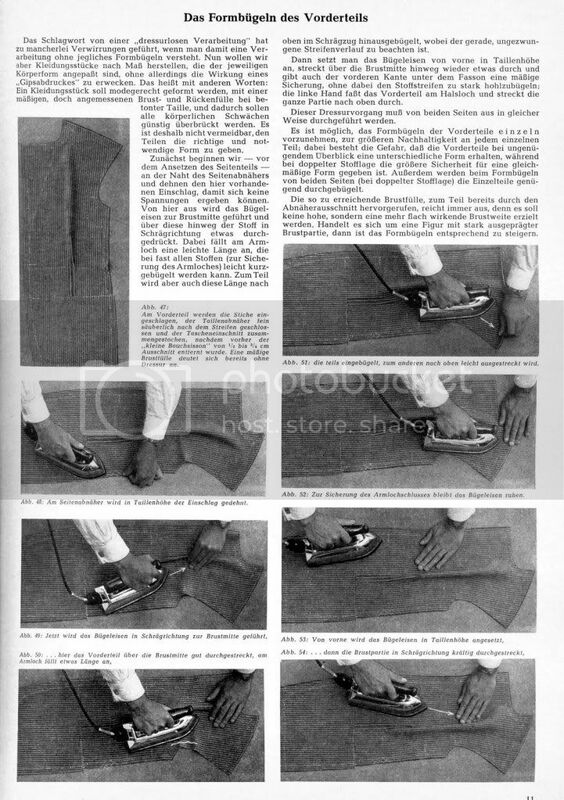 Nothing replaces a heavy iron, dry or with steam, but I don't want to miss my suction table at home or at work. Actually, I think it should be: There is only one (cutting) system and DZ is it's prophet! Thank you anyway. Tried it last evening, it is great. Well I believe that the Archangel has already dictated the one Supreme Truth to the Prophet Czujiewiecz. However, the Eternal Truth of these words is concealed behind smoke and mirrors. Alas, there is much that is confusing and mysterious in the Prophet's words that has appeared in print. I think it's best to know more than one system, so you can pick up different ideas for making several styles (so Rundschau is not my only system). Rundschau has a few quirks, like the very straight shoulder line, which needs to be corrected. 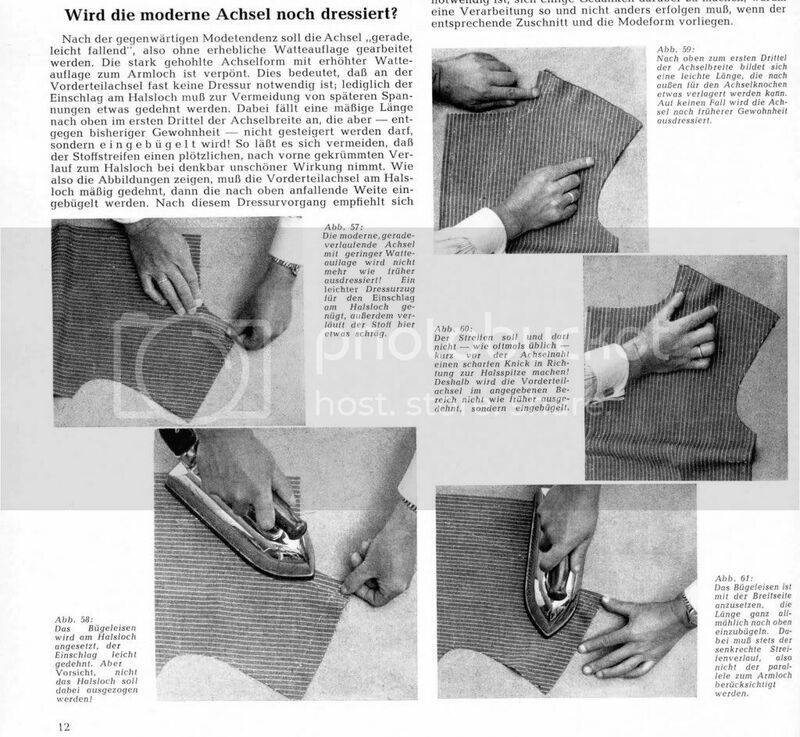 The Italian way of dealing with the slope of shoulder is a bit better, I have tried it on my Rundschau based coat and it saved me lots of trouble (I used the Italian formula and compared the result to the direct measurement and they were almost 100% identical). 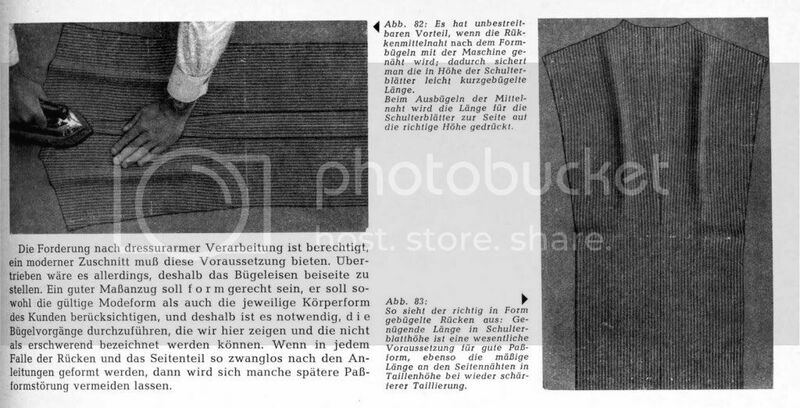 I should also add, that while the Rundschau draft was good until the mid seventies, it has slowly mutated to what we see today in most RTW coats, long fronts and short backs. 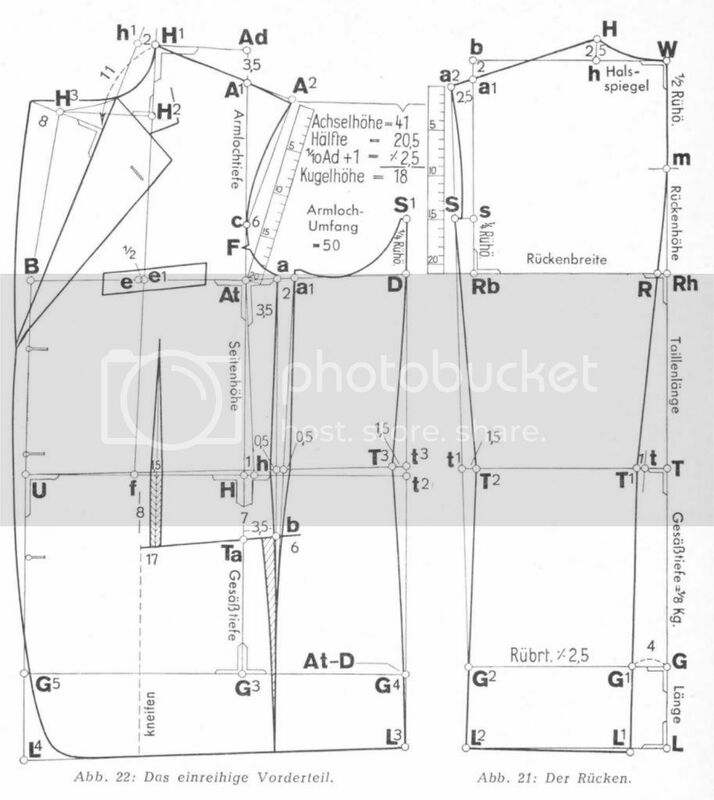 If you take a look at the pictures about checking/ trueing the pattern you will notice that the front and side seams are congruent, which made it very easy to sew the pieces together. The latest version has a side panel that is slanted above the waist line, causing the fabric to be "stretchable". 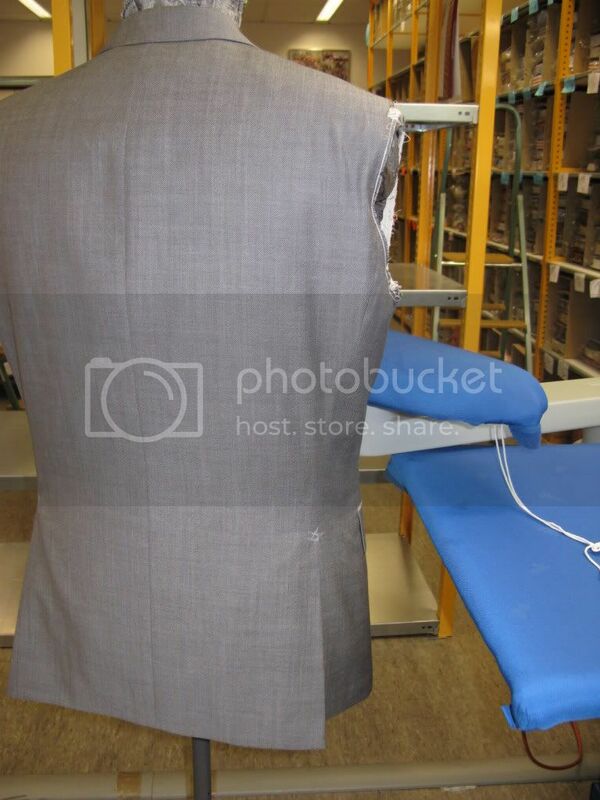 In many RTW coats you can notice that the side seam has been stretched out, causing a messy back in that area. There should be some ease in the back part, but most operators just stretch both pieces, side and back panel, because it's faster and easier to sew. In the following picture you can see that the side panel has been stretched, while the back piece is short. The deep armholes reduce the range where a coat can be tapered above the waist. That's why so many RTW (and MTM) coats look so boxy. That is where the British and Italian cuts have an advantage today. Actually, I do not use the shoulder part, and I do not like the waist suppression either. So for those, I use my own stuff. What I really do like is the way the front is constructed.